sun, cigarettes and software solutions, 2006. Until Canadian artist Bob Partington set up a studio in Istanbul a year ago, his practice consisted of computer-generated technical drawings and the occasional handmade mechanical sculpture that mimicked the systematic nature of these two-dimensional images. Istanbul’s organic, energetic urbanism inspired him to abandon his laptop and produce more hands-on work, so he began to paint. 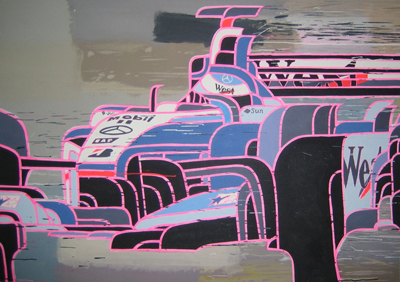 The six works on display depict Formula One race cars made with acrylic and other industrial materials such as fiberglass. This combination of media allows Partington to articulate areas with glaring, highly pigmented precision, while simultaneously crafting painterly landscapes that seamlessly melt into the fabric on closer inspection. The cars, often so large as to be cropped by the canvas’s frame, appear animalistic, bursting with a carnal vitality that mocks the corporate sponsorship logos with which they are adorned. These highly refined vehicles become emblematic of developing systems of efficiency and stored energy, apt symbols for the way people adapt in a city under increasing pressures of globalization.